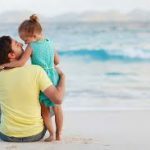 What to expect when dating a single dad? Both of my husbands were single dads. After the first husband, I planned to not be a step-parent ever again, but things don’t always work out that way. My first husband had custody of his children mainly because she didn’t want to. He tried to get her to take them, she had excuses, he tried reverse-psychology by saying he’ll just keep the kids, but that backfired when she agreed. The second husband had custody because she was ill. Tips for dating a single dad! ps: do not stay over on the first date! Society does help promote this type of behavior of single dads. Sadly, when a mom of three who was married to her new husband had died, the new husband had custody of these 3 children. You should have seen the gift certificates for food and restaurants that came in for him. Meanwhile, woman everywhere are dealing with a missing spouse on a daily basis and no one making sure they have food. Needless to say, the three went to live with their biological dad who lived in the same town. If you don’t have children, there is a transition period of learning to work around a single parents schedule. Also, there could be a mothering instinct in you to want to help – you must fight this at all times! Once you take on some aspect of his child rearing, it opens the door to more child rearing duties. Men do not have a problem with asking for help, they almost expect it. If you have children, then you are used to juggling schedules, and are used to doing many things at once. Try to not let a single dad infiltrate your domestic routine, ie: driving his kids around to events or school, or getting your older kids to watch his younger kids. Us women, and society, often think how amazing it is for a man to be taking care of his children. How ridiculous is that? What I’ve noticed, 95% of the time, is that these men really did not want custody, it was thrust upon them. I know it sounds like I’m man bashing, again, but just patiently observe, and you will see. So if you do start dating a single dad, just have some mental perimeters of how involved you will be. Also remember that there is a mom somewhere who may resent your presence. Know that she is part of the package deal and time doesn’t always make things better. Dating a single dad, should you? Also know, very important here, that if you do live with or marry a single dad, then split up, you could be paying child support for his children. Sure, perhaps he could be paying child support for your children too. I had this pointed out to me by a lawyer. I asked how it can be that I can be responsible for children that I did not know existed at one time, that I was not there for the conception, that while these kids were being conceived I was on birth control somewhere else, that I can be financially responsible for random peoples children? If you own property, don’t admit it. Rich parents? Don’t admit it. Watch and protect your money. Pay only your share of stuff. Get a prenuptial. Let’s face it, we know that relationships don’t always work out, I’m not saying to be sneaky, but just to protect what is yours. Sometimes single dads have stellar moments, like my first ex who seriously dealt with his daughters boyfriend by ramming his car! Here’s one single woman’s honest story about dating a single dad, worth reading!